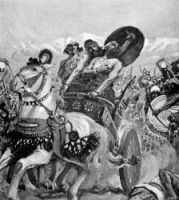 King Ahab, the son of Omri, was the seventh king of Israel. He ruled from 919-865 B.C. He married Jezebel, daughter of Ethbaal, king of Tyre, and in obedience to her wishes, caused a temple to be built to Baal in Samaria, and an oracular grove to be consecrated to Astarte. They both worshipped Baal and taught their people to worship him too. One of King Ahab's chief tastes was for splendid architecture, which he showed by building an ivory house and several cities. 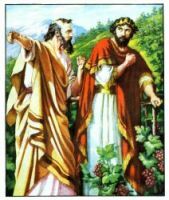 Desiring to add to his pleasure-grounds at Jezreel the vineyard of his neighbor Naboth, he proposed to buy it or give land in exchange for it. When this offer was refused by Naboth in accordance with the Levitical law, a false accusation of blasphemy was brought against Naboth, and he was murdered. Ahab immediately took possession of the coveted field. The prophet Elijah declared that the entire extirpation of Ahab's house would be the penalty appointed for King Ahab's long course of wickedness. The execution, however, of the sentence was delayed in consequence of Ahab's deep repentance. These pictures of King Ahab are drawn from a number of bible story books. Feel free to use these King Ahab pictures in your projects. Click on the King Ahab drawings below to see more details about saving a free image or about purchasing an image of King Ahab at a higher resolution.